- Depending on charting framework some apps will require internet connectivity to render. - Extremely quick and easy to implement. Here are a couple screenshots of the application displaying the charts (note all data is randomized). Some Basic Chart testing with flot …. Here is a simple view of how I handle the code and data within XCode. 2. Add or import the files into XCode resources. (I suggest creating a group called JS). 3. When adding a resource to XCode it will generally be marked as being needed to be compiled. Ensure that the files are not listed as being “Compiled”. The easiest way is to simply drag the files from Targets -> Your Project Name -> Compiled Sources into Targets -> Your Project Name -> Copy Bundle Resources. 5. Ensure that any file references in the <script> tags do not recurse or move into any folder (even if they are in one in your project). e.g. 6. 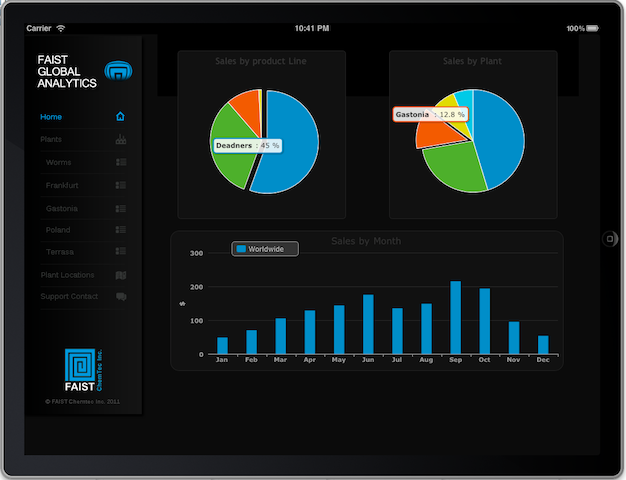 Create a UIWebView within Interface Designer and link it to your view (in my case I named it chart1). e.g. 7. Simply reference the HTML example file when loading. This overview does not cover retrieving data from your datasource but generally a webservice pulling data into a local SQLite DB would be the best bet. (or a basic plist if the data was simple enough). If you are interested in web services and doing some testing I would recommend checking out the ES Workplace which is a awesome test bed for SAP Web services. (Anyone else looking forward to Project Gateway as much as I am?) Part 2 will cover pull some basic data from ERP and displaying it within a chart, so stay tuned for more. As you can see (if you made it this far! ), this somewhat “hybrid” approach to visualizations on iOS devices is not perfect but a really good solution if you do not have the time, budget or resources for developing your own set of charting controls for the platform.